36/45/50 PP/Systems - Advanced 100-sheet Duplexing Single Pass Document Feeder (DSPF) with Scan2 Technology scans both sides of a document in a single, straight pass. This feature improves efficiency, reduces scanning time, and helps maintain the integrity of your original documents. Powerful 800 MHz true multitasking engine controller enhances multifunction capabilities for Copy, Print, Scan, and Fax operations. 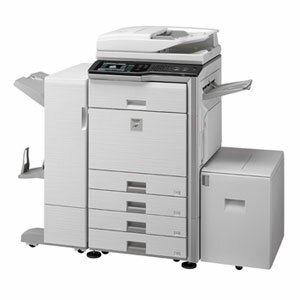 Robust job build feature and available online paper capacity of 3,100 sheets makes copying large jobs quick and easy. Integrated documents filing system enables users to easily archive documents. Standard tandem copy/print capability saves time and distribution costs when two Imagers are deployed on the same network. Advanced finishing with the optional Two-Tray Finisher or the Saddle-Stitch Finisher, which delivers a wide range of capabilities including 3-position stapling, center folding, 50-sheet stapling capacity and more. New Card Shot feature conveniently copies both sides of an ID card onto a single sheet of paper in a seamless operation. Auto duplexing on up to 97 lbs index paper with optional duplex unit.